Our group is part of the Interdisciplinary Nanoscience Center Hamburg (INCH), and the Center for Optical Quantum Technologies (ZOQ). We have also been involved in the coordination of the Son­der­for­schungs­be­reich 668 "Magnetismus vom Einzelatom zur Nano­struktur", the Cluster of Excellence "NANOSPINTRONICS", the Center of Competence HanseNanoTec, the German Center of Competence in Nano-Scale Analysis (CCN), and the Hanse­Nano­Net. Additionally, we have contributed to the Sonder­for­schungs­be­reich 508 "Quantenmaterialien" as well as to four Graduiertenkollegs of the Deut­sche Forschungsgemeinschaft (DFG): "Physik nanostrukturierter Fest­kör­per", "Spektroskopie an lokalisierten atomaren Systemen", "Design and Char­ac­terization of Functional Materials", and "Maßgeschneiderte Metall-Halbleiter-Hybridsysteme". In 2007 the group became partner of the NSF funded excellence network "The Spin triangle". In 2008 the group was awarded with one of the first ERC Advanced Grants (FURORE), followed by a second ERC Advanced Grant (ASTONISH) in 2013 and a third ERC Advanced Grant (ADMIRE) in 2018. Our research activities are concentrated on nanometer-scale science and technology based on scanning probe methods (SPM). In particular, we in­ves­ti­ga­te the fundamental relationship between nanostructure and nanophysical properties. We apply scanning tunneling microscopy (STM), atomic force microscopy (AFM), magnetic force microscopy (MFM) and other scanning probe methods (SXM) to various classes of materials, including metals, semi­con­duc­tors, insulators, superconductors, magnetic materials, molecular thin films, and biological systems. Laterally nanostructured materials are obtained by using SPM-based nanofabrication processes, which may be based on strong mechanical, electronical or magnetic interaction between probe tip and sample, as well as by using self-organization phenomena. Future nano-scale devices and ultrahigh density data storage systems are being developed in close collaboration with industry. Want to do your Bachelor, Master or PhD with us? 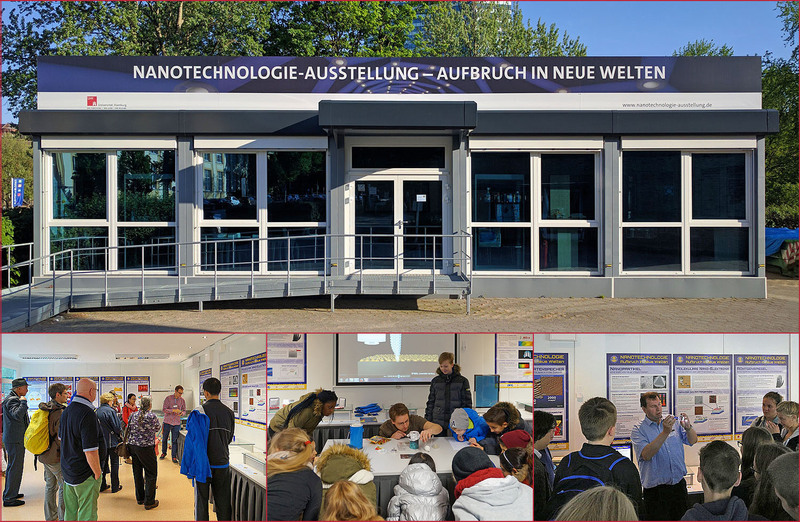 Visit our exhibition "Nanotechnology - Take off into new worlds" in Hamburg!